LG: We are talking with Larry Rhoades, Ex One’s CEO. Larry, when did you get the idea of doing this layered metal process to build products? LR: I’ve been involved since 1994. We were invited to join a consortium of companies developing the three-dimensional printing process MIT had invented with the objective of making plastic injection mold tooling. The group included United Technologies, Motorola, Hasbro, Johnson & Johnson’s Ethicon Endo-Surgery group, and AMP, now part of Tyco. Were you invited for a particular expertise? We had experience working with United Technologies developing new manufacturing methods and were known for our skills at finishing – improving surface roughness. We were experienced in developing new manufacturing methods, then bringing them to industry. We ultimately learned enough about the process that we took on the task of implementing this technology. That meant a lot of refinement – from university level work to building a robust industrial manufacturing process. Could you describe the technology as simply as possible? 3-D printing assembles particles with a device like an ink jet printer. We spread thin layers of particles, from 50 microns to 500 microns thick, and then send out little droplets of glue or binder from the print head. The glue droplets bind together the particles that will become the work piece. It’s a constructive process – layer-by-layer manufacturing. On each layer we assemble the particles together that represent the cross-section of the work piece at that layer, then lower the “build box” one layer thickness, spread another layer of particles and do it again. The droplets seep through the printed layer to the previous layer so the part is all stitched together. In the end you have a box full of powder, most of it loose, but buried within the loose powder is the article you want glued together firmly enough to aggressively get the loose powder separated from the glued together stuff. In some cases that becomes the work piece in itself with no further processing, which is what we do for sand molds – glued together sand particles. The ultimate metal part is made by pouring molten metal into the bonded sand mold to make a “casting.” For “direct metal” parts, we glue metal particles together, and then put them into a furnace for a thermal cycle to sinter them. Either we sinter to full density and allow the work piece to shrink about 15 percent in each dimension, or often we’ll just sinter lightly to fuse the particles without shrinking and use a second furnace step to infiltrate the tiny spaces between the fused particles with a metal having a lower melting point. Either way, we metallurgically bond them together, making a fully functional metal part. What do you think that the short-term, mid-term and the long-term possibilities are for the technology you’re developing? We’ve chosen three initial focus applications on the three critical dimensions of the process that we’ll continue to improve: speed, materials and accuracy. Our first initial application is sand molds for sand casting using big machines that build 30 cubic feet of product per day. Our second focused area is plastic injection mold tooling. We can make complex internal passages, which provide thermal transfer and cooling within the mold. The challenge is to make very strong, hard materials. We’ve developed a fully sintered M4 tool steel material that can be hardened to 63 Rockwell C fully capable of doing plastic injection mold work with a 99% density. We make components that have complex internal passages that let you manage the surface temperature of the mold. This allows you to control the sequence and speed at which the injection molded parts are formed, improving precision and productivity. The third initial application is making dental crowns, which we’ve launched after several years of development and a yearlong Beta test program with eight dental labs. This process makes gold “copings,” the foundation of a dental crown that must fit precisely on your tooth and prevents food particles from getting underneath the crown, causing decay. We can make these copings more precisely than present methods within a few hours, as opposed to three days. There are 40 million dental restorations done in the United States every year; three-quarters of those are gold copings onto which porcelain is then applied to make it appear like a natural tooth. 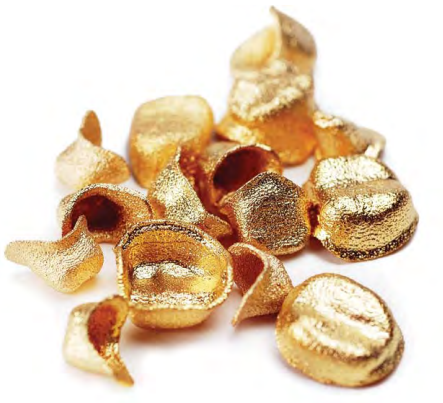 Gold is chosen because it’s anti-bacterial and helps to prevent decay and infection. In time we hope to converge these three dimensions of resolution, material performance and speed that these three initial focus applications are pioneering. We want to combine the ability to make all kinds of metal and ceramic products that have the net-shape resolution and precision we’ve learned to do in dental crowns with a broad menu of high performance materials, like the tool steel that we’ve demonstrated in injection molds. Finally, we’d like to have the kind of productivity we demonstrate in producing sand casting molds – producing precise, complex parts at production rates measured in cubic feet per hour. Can you tell me the economics today of the sand molds versus the old methods? The principal cost driver for sand molds is the expense and time required for the production of patterns. Normally, sand molds are made from resin coated sand packed into patterns, which is then cured and hardened with an activator. For an automotive engine, design and production of prototype patterns typically take six weeks to six months and cost $30,000 to $150,000. That cost then gets amortized over the number of parts you’re making, so the economics are volume-driven. In our process, volume and scale are relatively transparent, so times one or times 1000 doesn’t matter that much. If you’re making small volumes, our method is a much more efficient way to do it. You have them faster with much less labor involved. We saw the sand mold model you had in the IMTS exhibit. Is the material bonded together or cured when you put it through a furnace? With our process of producing sand molds the curing occurs in the printing, so there is no subsequent operation needed. We print the resin directly into the sand that has been pre-coated with an activator. When the resin and the activator combine, it cures. You need only to remove the surrounding loose sand in the build box to get your sand mold. Will this take the foundry business by storm? There are plenty of applications now that bring low volume castings into the game where previously they would have been whittled out of blocks of solid material. The process also allows the casters to get prototypes in the hands of customers sooner, so designs can be optimized quickly. Prototypes are made with the same sand, the same binder and with all the same characteristics present with pattern packed sand castings in full production, if the volumes are high enough to lead to that. We’re finding applications where our molds can be used in production casting, especially for complex production cores to make internal features. Tell me about the intersection of art and the product you’re doing. Artists have relatively unconstrained minds. Part of his or her mission in life is to explore boundaries and reach beyond them; maybe there’s some analogy there. Engineers are more constrained, since there is often great complexity involved in actually making things in production. The artists immediately “get it” and exploit the geometry freedom that this process allows, enabling them to make articles that couldn’t be produced otherwise. The artists help us to demonstrate the potential design freedoms to the engineers making functional parts while reducing the amount of material used and reduce part cost. Does this mean that a one of a kind sculpture may lose its value since it’s no longer going to be a one of a kind? Well, it’s still one of a kind as long as you don’t make another one. I think it allows people to express themselves more readily than they could if they had to chisel their concept out of a block of marble or make a mold and cast it in the old way. I think it allows the artist to spend more time being creative and exploring ideas and less time being a craftsman executing the idea. It’s the ultimate extension of Andy Warhol’s factory. Chris Anderson has written a book called The Long Tail. The theory is that, instead of looking for the blockbuster product all the time, the money is made with the long tail. You may have the spike on the graph for the blockbuster, but if you look at a graph, the tail goes on and on and on. When Amazon gets an inquiry looking for Danielle Steel’s latest novel, the buyer may also be interested in Steel’s seventeenth novel. When tracking what they’ve sold, they find money is really made on the long tail of products, not the blockbuster. This “customization of manufacturing” approach you have is in sync with this long tail idea. We did a piece on the MASH hospital for Humvees in Iraq and Kuwait using a Mazak machining center. Originally the plan was to have a laser powder machine in the truck, but the technology wasn’t there yet. I can’t comment on the laser sintering machine, but I would say one of our 3DP machines for making sand casting molds could be in that truck. You wouldn’t need to carry an inventory of bar stock, just a furnace and material you can melt and pour into the casting mold, then do the finish machining with the machining center. Is there potential for doing this on the moon or on a space station? As long as you’ve got gravity, I think that’s a very real possibility. This process even allows you to recycle, so if you have the ability to re-melt, refine and re-atomize the metal back into powders, you can keep making things from locally recycled materials. Whether it’s a space station or a village in Wyoming or a battlefield or an oil rig, there is great value in having what’s needed when it’s needed with as little baggage as possible. It’s somewhat akin to Starbucks in the customized drink approach. Starbucks is pretty labor intensive in doing that. I think it reflects the customized manual method where manufacturing started. That’s why we call it “manufacturing,” because it was manual. As we began to automate the production process, we became more dependent on scale. That dependence led to the agglomeration of production, which led to what we now have in our societal structure around cities. These new processes change that. They allow you to de-scale and return to a village and have what’s needed at the local general store that doesn’t have inventory other than raw materials. That doesn’t apply to everything, but that’s really where the decentralization of production takes us. I think within our time we will see spare parts being produced locally with one-off design licenses from the original design owner. The owner gets his toll for his design effort, and we have a protocol that allows only one article to be made that way. You envision a royalty arrangement on the manufacture of the article? Well sure, you have to reward the designer, but the design can be done anywhere on the planet. It can be transported virtually for nothing and virtually instantly. Does this point towards piracy issues? It could if we don’t develop a protocol to protect design rights. I think establishing a protocol and a global policing system that prevents pirated articles from coming back into the market they were created in is within our ability. I think for markets that don’t respect intellectual design property rights, their entire economies should be penalized with an overall tariff rate that’s related to a country’s respect for design rights, as well environmental issues and human rights issues. All of that can be grouped into a system that provides incentives within the exporting nation for compliance. There are solutions to the inequities of the emerging global economy. Making millions of parts halfway around the world and shipping them, with the added expense and inconvenience, just doesn’t make sense long-term. Where’s the seed money coming for this project? Is it mostly bootstrapped by you or from government or universities? It’s a combination of all those things. It comes from our customers who have articulated what they’ve needed. There is seed money from the government, which is a large customer for defense products. It is in the position of being the only customer for many products, so it wants to see the methods used be as efficient as possible. When you think of what the Defense Logistics Agency has to deal with – weapon systems that were designed in the 1940s and are still in use – how do they manage? They need to respond to military situations that they can’t predict and then need a near immediate response with parts they don’t have. They’ve made considerable investments in technologies that can accelerate the responsiveness of the industrial-base and reduce the risk of being “without” in the battlefield. The process and many of its improvements were conceived at MIT, and we work with a number of other universities to further improve it. At this point, most of the investment in developing and launching this process has been mine personally. This is terrific and utterly fascinating. I’ve been blown away by what you are doing and what it suggests. I think that manufacturing is at a critical juncture, because conventional assumptions can be questioned and reconsidered. You can look back and see the evolution of how we got to where we are, and suddenly there’s this breakpoint driven by processes like this. This process is driven by the fact that an ink jet print head and its controls can handle huge amounts of instructions every second and grow things from assembled particles. It suggests tremendous medical possibilities to me. That is the next wave and is what excites me the most. We have three programs now, and I’m looking to invest. We did a piece on the MASH hospital for Humvees in Iraq and Kuwait using a Mazak machining center. Originally the plan was to have a laser powder machine in the truck, but the technology wasn’t there yet. It could if we don’t develop a protocol to protect design rights. I think establishing a protocol and a global polic-3-D Thinking31 December 2006 in others, where our processes can make tissue scaffolds that become bone, tissue and, ultimately, organs. Organ assist devices are already in animal testing, and the possibility to make new organ scaffolds, which are incorporated into the human body and repopulated with the patient’s own cells, is on the horizon. Making a pancreas is high on our list, and we’re working on livers and lungs. Being able to make a tissue scaffold that is then infused with the patient’s own cells to become a functional part of his body is, I believe, achievable within ten to twenty years. Where do you dream this technology will take us in 25 years? When you think of what’s involved in our process, assembling particles layer by layer, in many ways it’s much simpler. Layer by layer, we do the same thing over and over again. You don’t have tool wear, and you don’t need to wait for bar stock of a certain size to whittle down. All you need is powder. You can blend powders to make alloys, or selectively print alloying agents in the binder droplets – just like printing colors. I wouldn’t be surprised if in 25 years about half the things that we make out of metal with conventional machining could be made more efficiently this way. Whether you look at subtractive multi-tasking machining centers or Ex One three-dimensional printing systems, they are headed in the same direction – highly flexible machines that can make just about anything when it’s needed, where it’s needed, without all the waste of distribution. This new direction will make life easier, especially in places people want to live, close enough to the countryside to enjoy it, without having to tolerate getting in and out of places they’d rather not be. All the inherent technology and automation that enables this change, I think will bring us, ultimately, closer to Nature. Copings are made by assembling gold powder particles in layers, each 50-microns thick.